OpenSignal, a company which specializes in analysis of wireless network mapping, has come up with their second report on State of Mobile Networks. The report is prepared on the basis of more than 7 billion tests obtained from 708,504 mobile devices across India. The tests were conducted over a 3 month period from June 1 to August 31 this year. 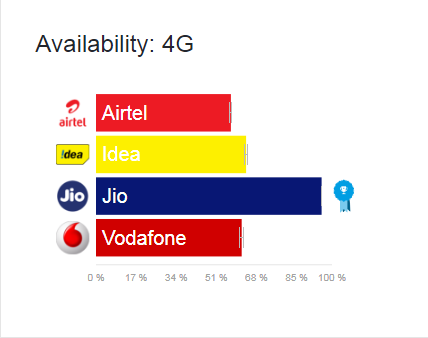 Reliance Jio being the only company with a pan-India LTE license, scores highly in overall coverage. Jio's growth rate has been on the higher side since its launch last year, and with improved speeds, the telecom operator bags the overall speed award. The speeds were not the best, but the huge presence in the country helped it win the top prize. Jio averaged a respectable 5.8 Mbps speed, which is a significant improvement over the last OpenSignal report. The number has gone up by 49% compared to previous results, which recorded an average speed of 3.9 Mbps. The already incredible reach of Jio improved further in the last six months. The testers were able to connect to an LTE signal more than 95.6% of time, which is almost 32 points higher than its next competitor. Talking about network availability, the numbers of other operators lags behind due to their limited reach in the country. Jio is one and half times better than the second placed operator, which is a hug lead. 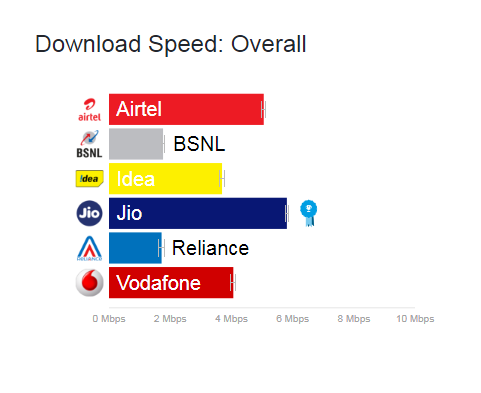 Jio topped overall speed in all the major states of India. Though Airtel recorded higher network speeds and got the award for both 3G and 4G, the number actually went down from 11.5 Mbps to 9.1 Mbps on 4G. Jio takes a hefty lead in two of the four parameters in which it was counted. Since Jio doesn't have 3G network, it was not counted in download speed and latency for 3G. While the download speed increased significantly, it was still the last placed network in download speeds and latency, but scored outright wins in availability and overall speeds.